Don’t. Seriously, don’t try to do any gardening when it’s as hot as it is in my part of North Carolina right now. We are predicted to see — and feel — a string of at least five days with highs hovering around 104 or so; humid nights may drop into the upper 70s if we’re lucky. No rain, of course, barring the iceberg’s chance in Hades of a random thunderstorm. I chose the photo above, because the warm colors of the Cosmos flowers provide at least a faint reflection of the sun’s intensity. They have turned out to be lovely little annuals; I hope they survive the heat wave. Several visitors to my blog have lately found their way here by searching on how to garden in this heat. My advice follows. Seriously, don’t try to do anything significant when it’s this hot. That means, no weeding or planting. Don’t do anything that will disturb the soil, because such disturbances will release soil moisture into the air and harm roots of plants you’re trying to help. Do all your watering and harvesting before 7:00 a.m. If this means you must get up an hour early, so be it. Plants will best be able to withstand handling from picking before the sun reaches full power. Watering just after dawn gives the plants time to absorb the moisture before the searing sun compounds the stress they’re under. Watering late in the day in this heat and humidity increases opportunities for fungal diseases and visits by snails and slugs. Water in the early morning, period. Water plants deeply and not every day. Although it’s labor-intensive, the best way to water during heat waves is by hand. You take the end of the hose, position it at the base of a plant, and add water until the ground stops absorbing it. That’s the ideal. If you are like me and water is a limited resource, time the amount of water each plant gets, and give the most water-sensitive plants more water than the tougher plants. 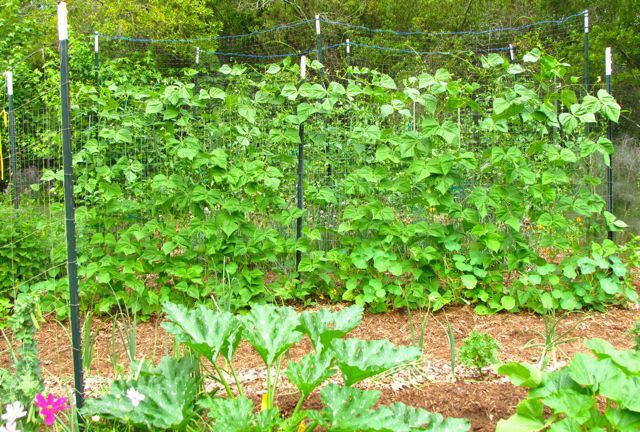 In my garden, squashes and beans need more water than tomatoes and peppers, and peppers need less than the tomatoes. My remaining squashes (I’m down to four now) get 1.5 minutes of water; beans get 2 minutes; tomatoes are surviving on 1 minute; peppers have been getting 30 seconds of water every other day. Don’t overwater. Now that the heat wave is fully here, I plan on cutting back watering to every third day. In this kind of heat, vegetables go into a holding pattern as they fight to simply survive. 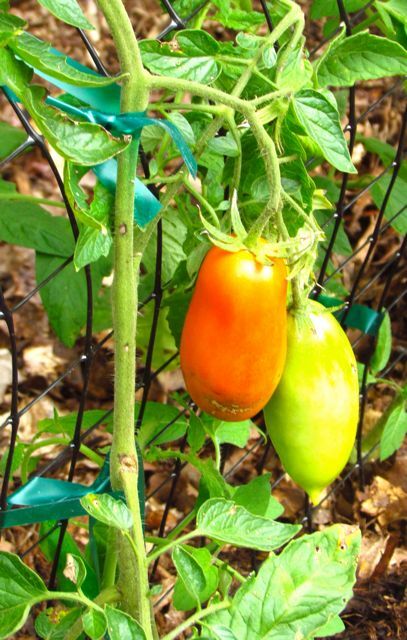 Tomato flowers and other veggie flowers don’t set fruit when daytime temperatures exceed 90 degrees. Fruits won’t expand much beyond their current sizes; the plants just don’t have the resources to grow. Be proactive about harvesting. Fruits that reached a mature size before the heat set in will continue to ripen if the plants can hang on. It’s important to pick the fruits as they are ready to reduce the likelihood of fungal diseases and insect invasions. By harvesting just after dawn, you minimize stress on plants, and maximize the viability and nutritional value of the fruit. If you didn’t mulch your vegetable garden, you are going to have a hard time keeping your plants alive. Old-fashioned row gardening, in which you hoe the weeds between rows, may have been how your grandmother did it, but it is not good for the soil, your plants, or your back. 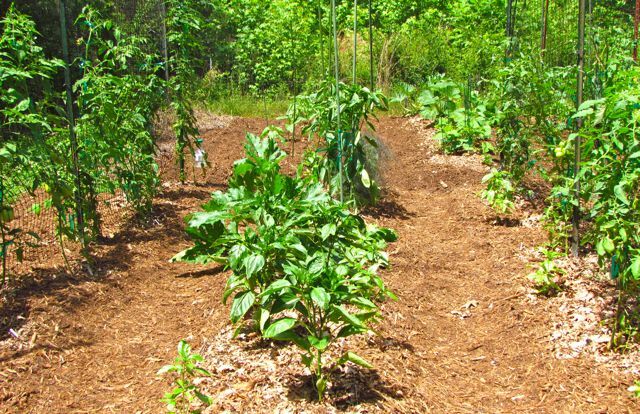 With the increasingly erratic weather patterns we now experience, and especially because those patterns tend to extremes like drought, heat waves, and floods (if you’re in Florida), the best way to ensure a productive garden is by using raised beds with mulched plants. Mulching plants is hard work, I admit. But it is spring gardening work, when our weather is still bearable. 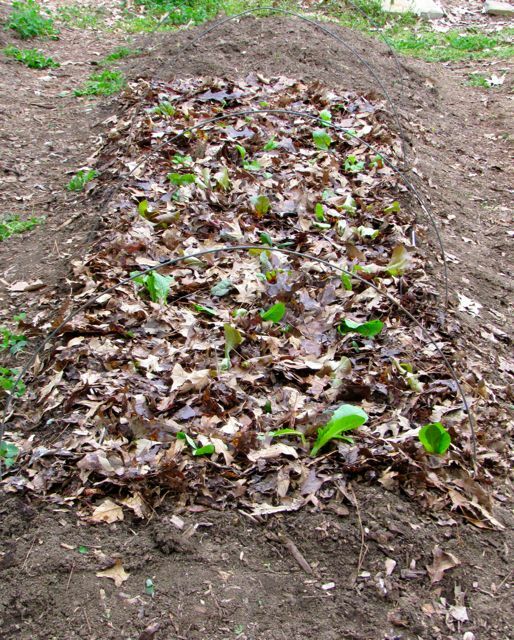 The best mulch for a vegetable garden is last fall’s leaves. If you have a big yard full of trees like me, you can simply rake and save your own leaves. But if you live inside a city and have a smaller lot, every city I know of in my area collects leaves in the fall. In the spring, citizens can go get as many loads of composted leaves as they can carry, sometimes for a small fee, sometimes for free. When Wonder Spouse and I lived in Raleigh some 30 years ago, that city would deliver an entire dump truck load of leaves to your door — for free! Gardening is always an act of faith, and sometimes, despite doing everything right, weather disasters happen, plants mysteriously die, a herd of rampaging deer storms and shreds your garden. You can never be sure that your hard work will pay off. That unpredictability is part of why I remain an engaged, obsessed gardener after over 40 years of bumper crops and total losses, exquisite flowers and slimy slugs. I cherish the beauty intrinsic to the natural world all the more because I know it is fleeting. Mother Nature is a temperamental teacher, and she does not tolerate fools. During this southeastern US heat wave, stay indoors where it’s cool, stay hydrated, and complete your essential garden tasks by dawn’s early light. Rain dancing — although optional — is highly recommended. I’m adding this addendum to yesterday’s post, because I can see from the searches hitting my blog that folks are frantically trying to figure out how to keep their ornamentals alive. Here’s my quick-and-dirty advice. If you are a lawn lover, don’t mow yours until the heat wave breaks. If that means it’s a little shaggy in spots, that’s still better than exposing freshly cut grass to the searing heat we’re getting. Stick to your regular watering schedule if your lawn is accustomed to supplemental water. If you planted trees, shrubs, or perennials this spring, they will need supplemental water during the heat wave, if the ground around them is dry. Our clay soils hold water a surprisingly long time. Stick your fingers below the mulch layer to assess the moisture content of the ground around the plant. If you didn’t mulch these newbies, do so as soon as you can. Without mulch, they don’t have much hope of surviving. If your new ornamentals are planted in full sun, they will wilt in the mid-day heat no matter how well-watered they are. This is an adaptive mechanism of the plants. 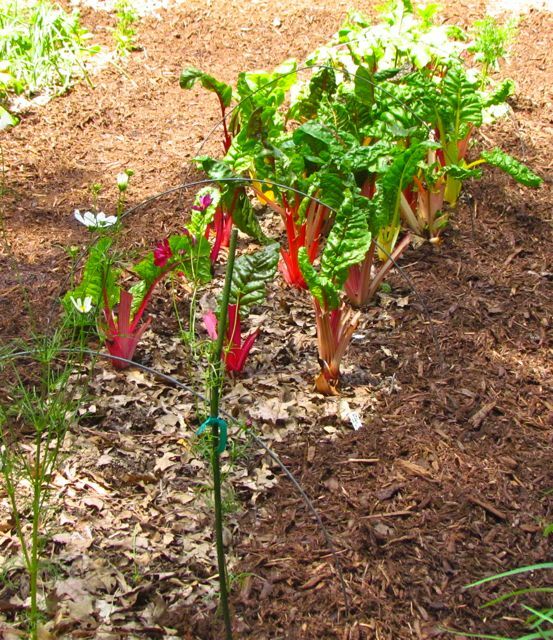 If they have healthy, moist root systems, they will perk up when the sun goes off them. 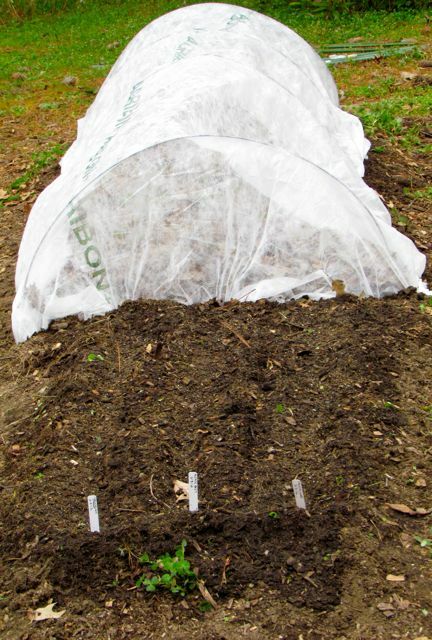 If your new plants aren’t adapted to full sun but they are getting a lot of sun, try improvising some shade for them somehow. It might improve their survival chances. Don’t fertilize any plant during a heat wave. The roots will be damaged. Don’t spray any plant during a heat wave. You will do the leaves more harm than good. Your goal is to minimize the stress they are under by protecting them from the sun if you can, and by watering deeply once a week to encourage deep root growth. Shallow roots arise when plants are watered frequently for short periods. Such root systems are much more easily damaged during heat waves/droughts. The vegetable garden is enthusiastically growing; visible increases are evident daily. Even so, I’ve been trying to find a good day for foliar feeding for about a week now. For those who may not know, foliar feeding is the application (via a sprayer) of a dilute solution of fertilizer directly onto the leaves of plants. Leaves directly absorb nutrients from the droplets, thereby giving the plants an almost instantaneous boost — much faster than plants receive via soil applications of fertilizer. I’m an organic gardener, so I use a dilute solution of a mixture of fish emulsion and sea weed. That gallon bottle in the photo above has lasted me several growing seasons, and will last me several more. The empty gallon water bottle on the left is where I mix my solution. I use that old metal tablespoon in the foreground to measure out three tablespoons of fertilizer into the water bottle, then I fill the bottle with water and shake. Measurements are not exact, nor do they need to be. Fish emulsion is stinky and messy — wear gloves. 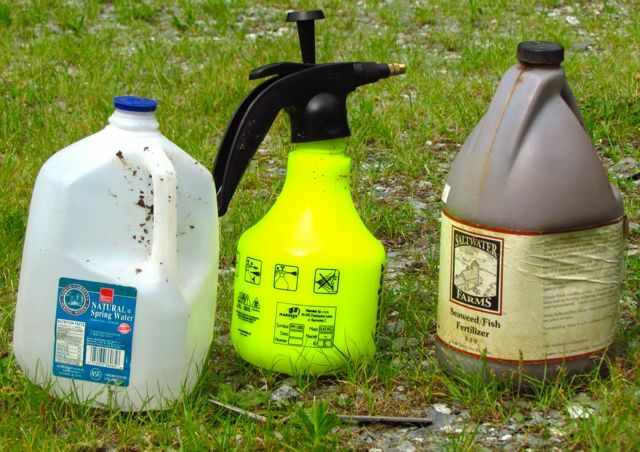 I pour the dilute solution into that little yellow hand sprayer in the photo. I used to use larger back-pack sprayers, but they are heavy and cumbersome. And now that I’ve downsized my veggie garden, this little sprayer works just fine for me. The only trick to foliar feeding is finding an ideal moment for spraying. You absolutely can NOT spray the plants when the sun is shining on them. Water droplets magnify the power of the sunlight, and you will end up with damaged, even burned-looking leaves. Your garden must be in full shade, or you must wait for a cloudy day. Unfortunately for me, my garden doesn’t go into full shade until quite late in the day. Foliar feeding just before nightfall is less than ideal, because you run the risk of the leaves not drying, which can lead to mildew issues. And the mosquitoes are ferocious that time of day, which makes application quite an ordeal. This morning I got lucky. Clouds ruled the sky until about 10:30, so I hustled outside, picked ripe fruits, tied a few tomatoes, then foliar fed my garden. Even though my veggies were growing well, I knew it was time for a foliar feeding application because of the bugs. I have removed seven young tomato hornworms from my tomatoes, and today I discovered and removed a mass of bronze eggs laid by a squash bug. Foliar feeding makes leaves less appealing to insects who chew on them, and more disease resistant. The dilute sea weed extract in the mix contains a number of trace elements that work to fortify the leaves against intruders. Sometimes when I have foliar feeding solution left over, I spray plants outside my fences. When I do that to daylily buds, I’ve noticed the deer pass them by. I guess sea food isn’t their favorite. The entire garden smells faintly of the ocean after I apply this fishy goodness, but only until the droplets dry on the leaves. Today that happened very quickly; our humidity is uncharacteristically low. On a more typical humid summer day, drying might take an hour or so. No matter how careful I try to be, I always end up smelling like the solution, so if you try this technique, plan on time for a shower when you’re done. As I mentioned, the veggies are cranking bigtime, as evidenced by the first tomato harvest of the season today — 2 Sweet Treats cherry tomatoes. Last year, these were just turning red on June 21, so I’m about three weeks ahead on tomato season. Squashes are producing regularly. The Y-Star Patty Pans have really great flavor. We’ll definitely grow those again. 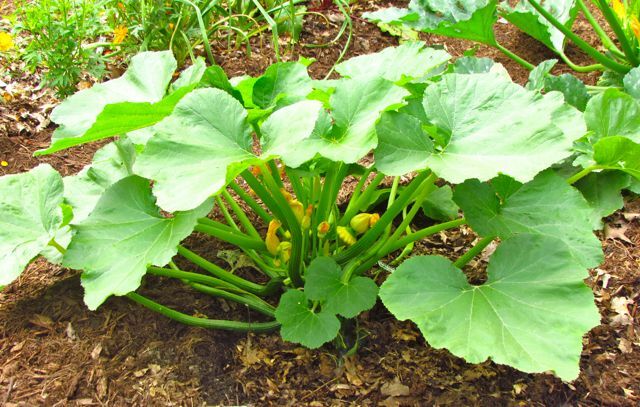 Y-Star Patty Pan squash plant is producing tasty results. 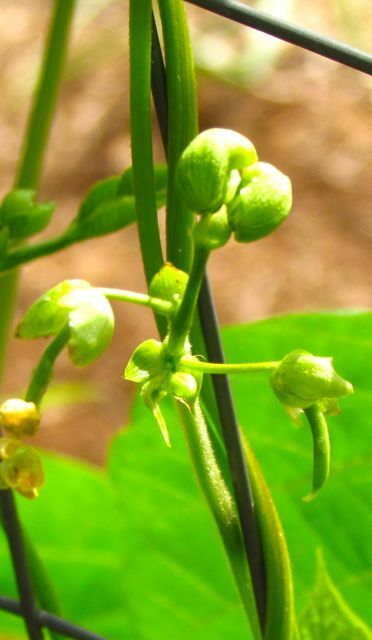 Fortex flowers have been blooming for about a week now, and the vines sport many tiny new beans. 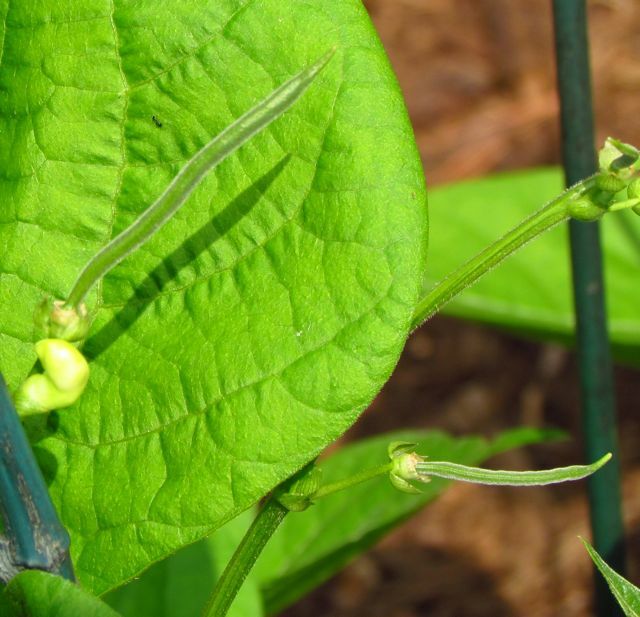 I’ve found the Jade bush beans produce better with a little support from bamboo stakes. Jade beans are growing very quickly. Sweet Treats tomatoes are ripening quickly. Super Marzano tomatoes will be ready for sauce soon. Viva Italia paste tomatoes will be ready soon after the Super Marzanos. As you might imagine, there’s much more going on in the garden and yard these days. I took a lot of pictures today. Soon I’ll show you some new current bloomers and some coming attractions. Now I go to bake the season’s first batch of zucchini bread. Soon the house will be filled with spicy cinnamon goodness. And thanks to the return of the clouds that are holding down our temperatures well below seasonal levels, the warmth from the oven won’t be unpleasant. I love any excuse to play in the dirt with plants, but I find it’s equally satisfying to cook and devour the fruits of my labor. I hope the gardens of my readers are as productive as mine, and that they provide you with delicious meals all season long. Yesterday morning as Wonder Spouse and I headed out the front door for a day of gardening chores, we were greeted by the lovely creature in the photo above. Both of us grabbed our cameras, but since Wonder Spouse’s camera and photography skills are vastly superior to mine, these photos are his. 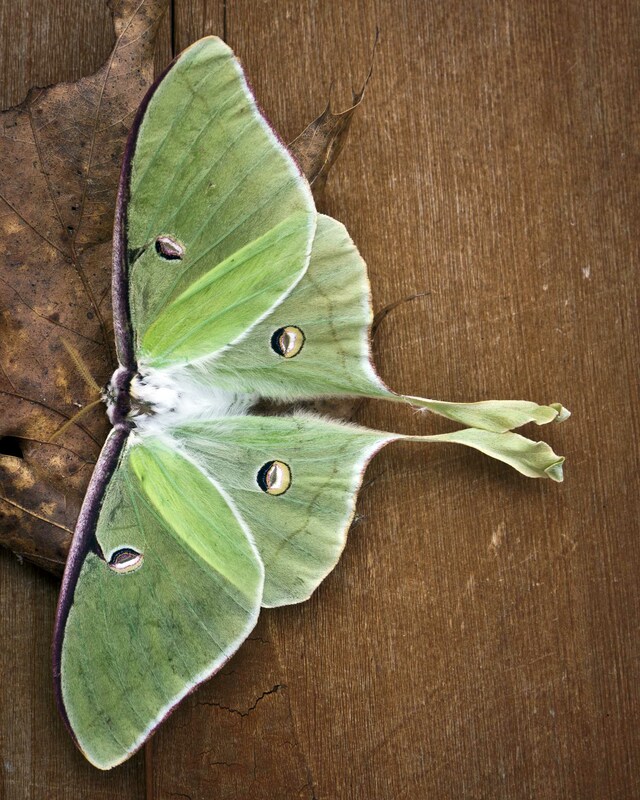 What a gorgeous creature a Luna Moth is, don’t you agree? According to my research, their caterpillars eat birches, persimmons, sweetgums, hickories, walnuts, and sumacs, which means they must be very happy in my yard, where all these species thrive. Normally, we only see them at night beating against windows. 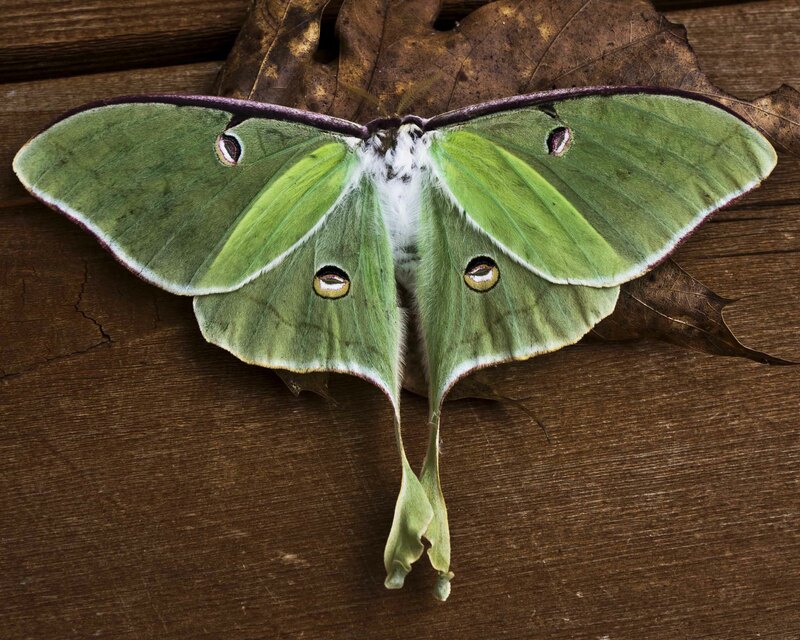 To see and photograph an intact Luna Moth literally at our doorstep was well worth postponing garden chores for a few minutes. This one was wounded; its body had been bitten. It was still alive, but just barely — too weak to argue with us when we relocated it for its photo shoot. 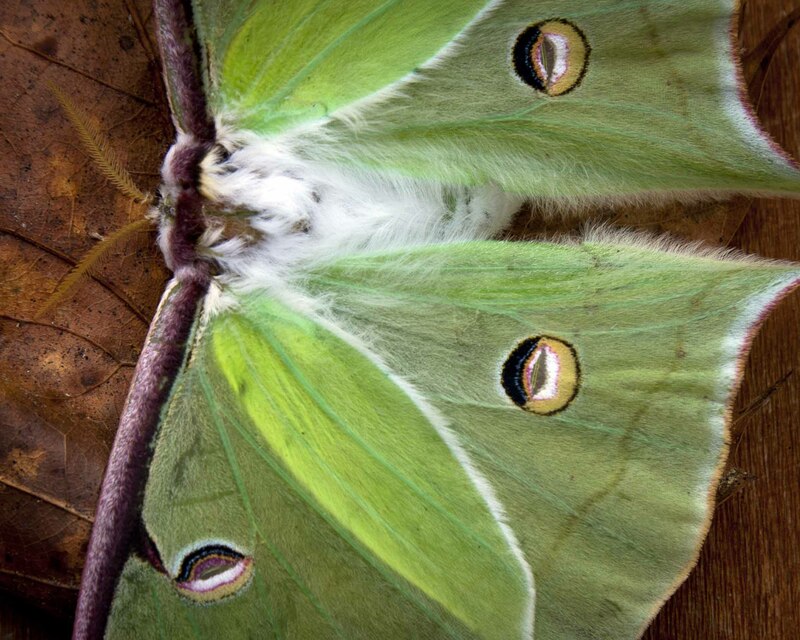 Those eye spots, the subtle veining in the wings, the feathery edges — so exquisite. Yesterday, we practiced a bit of lunacy by working out in the heat and humidity most of the day. Twenty years ago, we built the raised beds in our vegetable garden by digging out paths between the beds and heaping that soil onto the beds. We filled the lowered paths with aged wood chips left behind by our arborist. 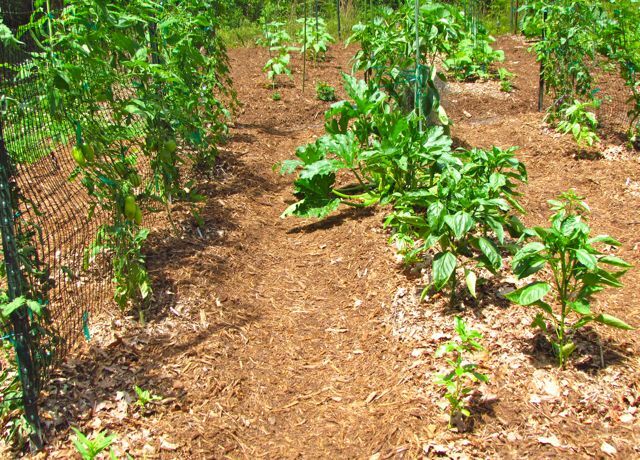 The wood chips raised the level of the paths by about six inches, providing weed suppression and, more important, a moisture reservoir for the beds. 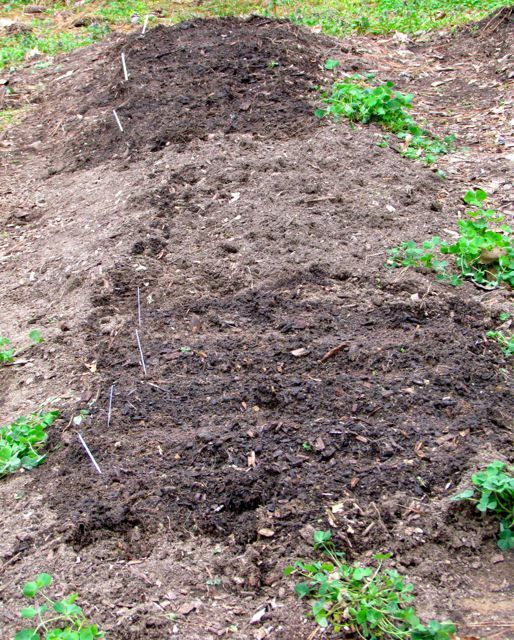 During heavy rains, the chips soaked up any excess water, then slowly released it into adjacent beds as the soil dried. These paths also made excellent earthworm habitat. But every three or four years, the wood chips break down into soil, leaving low paths prone to vigorous weed populations, so we add new chips. We had intended to do this last year, but never got to it. We were out of wood chips, so about a month ago we purchased a dump truck load of mulch from a nearby supplier. The wood chips — run through the chopping machine three times — were reasonably well broken down; we think they’ll last several years before the worms transform them. The lunacy? Over the past few weekends, the Amazing Wonder Spouse has moved many, many wheelbarrow loads of mulch from the giant pile left by the truck to the garden paths. I’ve been spending nearly every morning weeding the paths, so that they’d be ready for the chips. We put down paper or cardboard first to help slow weed encroachment, then piled on the wood chips. After Wonder Spouse dumped a load, I’d rake out the chips evenly across the paths. It was hard work, but all the vegetable beds are now surrounded by mulched paths. 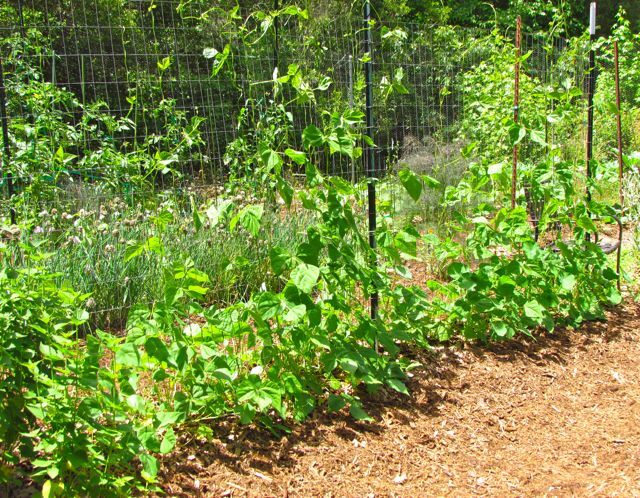 No weeds — just happy vegetables and mulched paths. I am delighted, and I imagine the vegetables can feel the difference as their beds remain more evenly moist, and weed competition is nearly nonexistent. Tomatoes to left and right foreground, with peppers and squash between. We used last year’s fallen leaves to mulch around the veggies, and filled in with the shredded wood mulch in open spots and in the paths. I’ve no doubt that our neighbors thought we were nuts yesterday as we worked straight through the afternoon heat, but we were determined to finish before the rainstorms promised for this week arrived. If all goes as we planned, rains will saturate the newly filled paths, leaving our vegetable garden well-prepared for summer’s heat and likely dry spells. 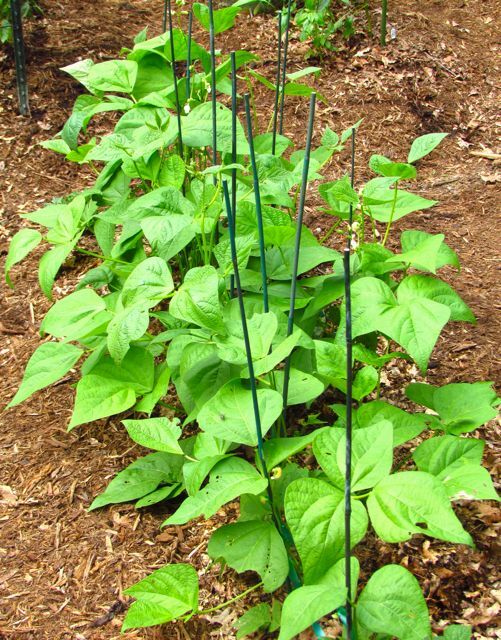 The Fortex pole beans exploded up their trellis even faster after their surrounding paths were mulched. The mulch pile is almost gone. Wonder Spouse thinks there might be enough left for one more wheelbarrow load. We’ll be ordering more soon. I’ve still got to reclaim the front flower garden from the hooligan weeds that have been ruling unchallenged while I’ve labored on the edibles. Paths around the rainbow chard finally got mulch yesterday. These eternally cyclic chores of weeding, mulching, and agonizing over the weather probably do seem like the acts of a lunatic to some. The reverse is actually true for me. These tasks keep me sane, centered on the rhythms of the seasons, attentive to the dances of butterflies, and the sweet scents of a succession of flowers. Lunacy was once thought to be exacerbated by a full moon, and we’ve got one coming up next week. However, instead of lunacy, if you live near Chapel Hill, North Carolina, consider celebrating early June moonlight in the beautiful gardens of the North Carolina Botanical Garden. On Saturday evening, June 2, they’ll be hosting their first ever Carolina Moonlight Gala. This fundraiser for the Garden will include good food, live music for dancing, and an auction with items ranging from gorgeous artwork to fabulous vacation getaways. Even if you can’t make it the Gala, you can still bid on auction items online via the link above, and all proceeds benefit the programs at the Garden. Lovely, aren’t they? Due to a childhood filled with perpetually pink gifts from a well-meaning grandmother, I’m not usually a big fan of pink. However, these daffodils were freebies from the same company that gave me the pink hyacinths I showed you here. Both sets of bulbs have prospered. And in my fantasy garden land where I stay on top of all my chores, they would have been divided and spread around several years ago to prevent the crowding that inevitably leads to diminished blooms. These bulbs are rapidly approaching that limit. Will I get to them? Unless friendly garden elves suddenly appear to help me, probably not. Most days on my five acres, I am so besotted by the beauty I encounter at every step that I manage to ignore all the to-dos clamoring for their turns. Today, as creaky joints and aching muscles protest my every move, the beauty is being outshouted. I spent the last two days finishing the initial planting of the spring vegetable garden. I was pushing hard to exploit a window of absurdly mild, dry weather that preceded today’s morning rain (a mere 0.28 of an inch). 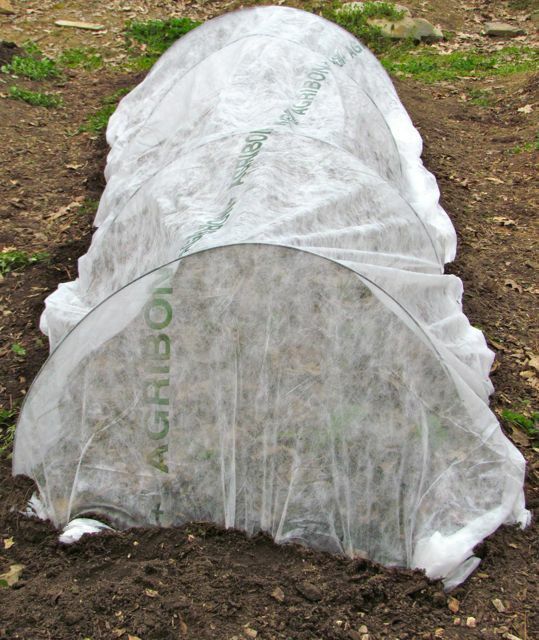 This weekend, temperatures will dip a bit below freezing — not enough to slow my well-watered and tucked in spring veggies. I realize the cloth isn’t exactly draped elegantly. The wind was blowing in a cold front, so I settled for functionality and disregarded aesthetics. You can see that I am not compulsively neat. Functionality is my concern. I’ve found that these crosswise initial planting rows usually work well. I sowed the seeds relatively thinly, but if the plants germinate well, I’ll need to thin them. That’s why I left spaces between the planting sites. If I end up not needing the space for greens, I’ll tuck in flowers and herbs there. The greenhouse looks much emptier without its crowd of robust greens. 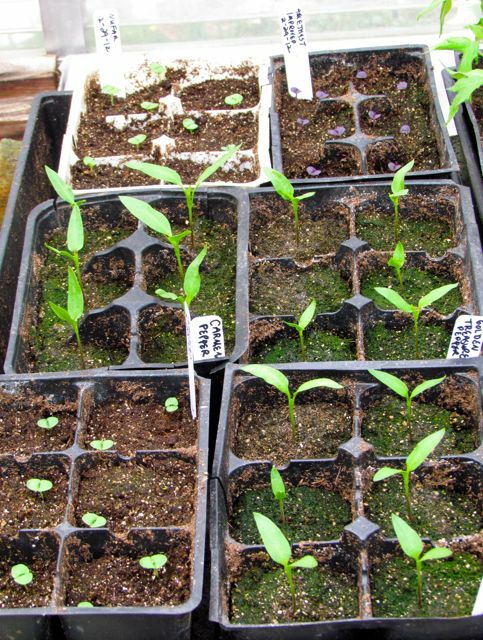 But the remaining seedlings are — mostly — doing well. I always start six plants of each tomato and pepper variety. I plant out two, and find good homes for the rest. That’s never a problem; I’ve found that few folks say no to free tomato and pepper plants. However, Super Marzano — my other new tomato variety this year — yielded a 100% germination rate. For some reason, I lost my mind and planted twelve seeds. 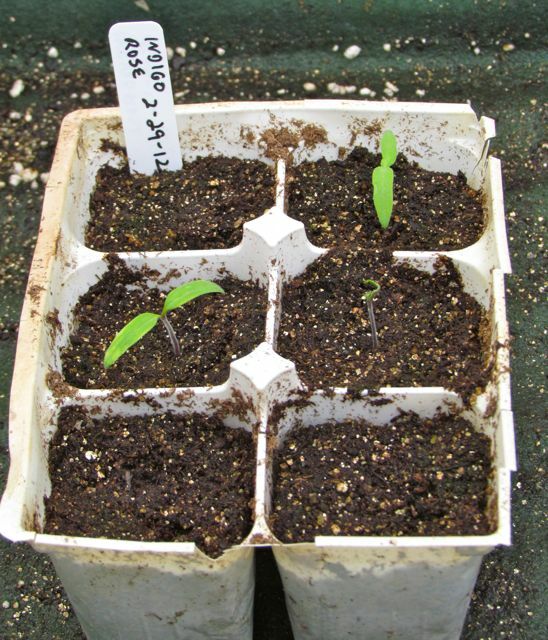 Here they are with my four reliable tomato varieties, all of which also germinated 100%. The Super Marzanos are the big ones in back that had a two-week head start over the others. Note the purple-colored Amethyst basils at the top right. The Super Marzano tomatoes will need to be upgraded to individual pots very soon. And it’s almost time to sow more flower seeds in the greenhouse. In fact, it’s probably time right now. After the upcoming chilly weekend, next week’s temperatures are predicted to soar into the upper seventies, with nighttime lows not dipping below forty. That’s crazy talk for mid-March; much more what I’d expect for middle to late April. The good news? I am well-prepared with an abundance of enthusiastic veggie seedlings to try to wrest spring and summer veggies from too-warm, too-dry soil. And as soon as I am able to once again walk fully upright without limping or groaning, I’m going to get right on that. With the onset of December, it’s time for the second installment of Gifts for Gardeners that I promised. For those who missed it, you’ll find gift suggestions for experienced gardeners in my earlier post here. As a well-seasoned gardener who has answered many, many gardening questions from newbie and intermediate-level gardeners, it is my opinion that these folks usually start digging without a plan or any real understanding of their gardening environment. Sometimes the problem is that folks relocate to the southeastern Piedmont from other parts of the United States — or the world. But they continue to try to use the same techniques — and even plants — that worked for them elsewhere. Sometimes the problem is plain lack of knowledge. Perhaps someone moves into their first home with a yard and suddenly must maintain a landscape. Or perhaps someone resolves to grow her own vegetables without any knowledge of the steps required for a successful food garden in the Piedmont. What all these folks need most is information, especially region-specific information. I offer here a number of ways gift givers can provide the inexperienced gardeners on their list with the information they need to succeed. Hire a garden coach — Yes, they exist, and they are the fastest, probably most expensive way to get your newbie gardener on the right track. Garden coaches come to your house and help you understand what is growing on your property. 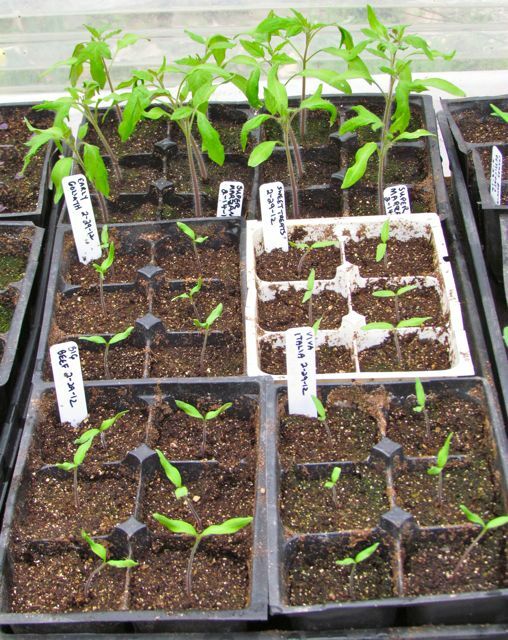 If you have ideas about plants you’d like to add, they can help you figure out what varieties are likely to succeed and where they should be planted. They will also help you plant your additions. They don’t do all the work; a garden coach is there to teach you the skills you need to do it yourself. 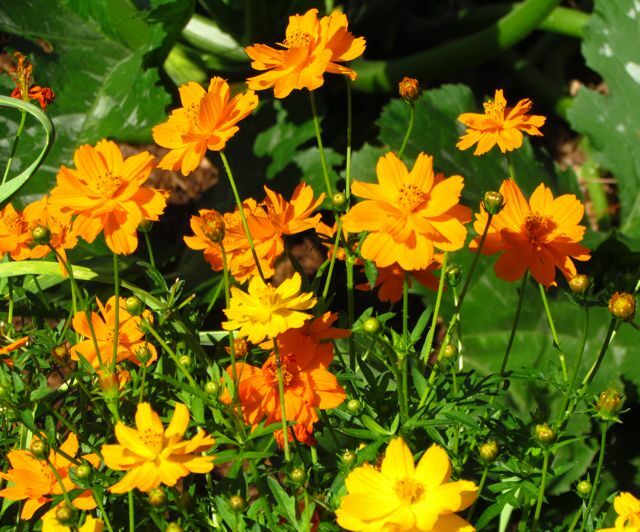 They can show you how to divide and replant perennials. And for more skilled gardeners, they can offer you a hands-on session on pruning the shrubs and trees in your yard that need help. To find a garden coach in your area, try your favorite search engine, or ask the staff at your favorite local nursery. They probably know someone they can recommend. 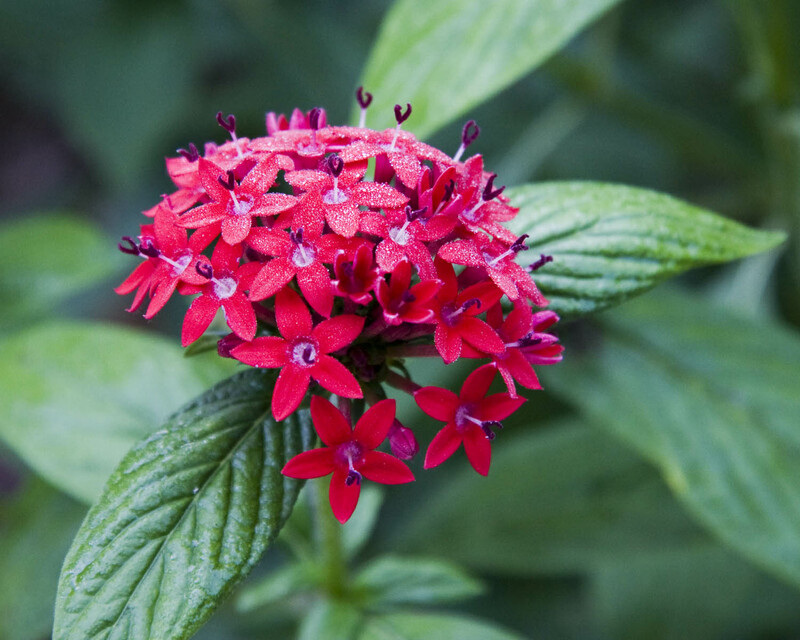 Buy a gardening class — I live within 35 miles of three significant public gardens: the NC Botanical Garden, Duke Gardens, and the JC Raulston Arboretum. All three offer classes to the public on a wide range of subjects. Public gardens throughout the southeastern Piedmont offer such classes. 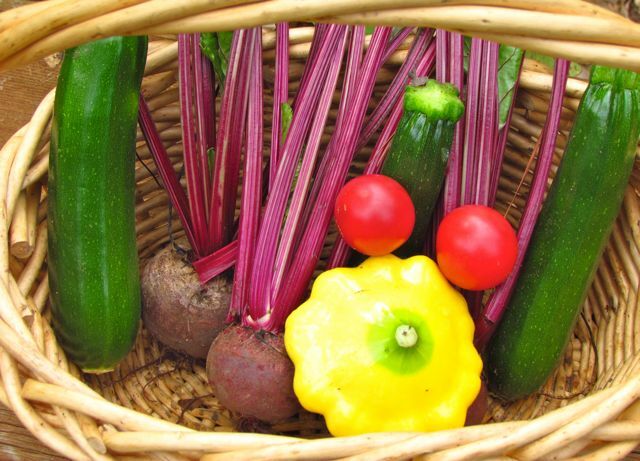 Visit their Web sites, peruse their offerings, and sign up and pay for your newbie gardener to attend a class. In North Carolina, the Agriculture Extension Service in every county offers much free information on gardening. The agents in my county offer free classes that are very popular and helpful, especially for beginners. In this case, your gift could be ensuring your new gardener can attend the class by offering to babysit, run errands, or otherwise free up her time so she can attend. I suspect similar groups in other states offer similar educational opportunities. If all that sounds too difficult, I recommend a subscription to one of the many excellent gardening resources available. These publications vary in price and level of sophistication. For new gardeners, I recommend magazines that contain as much region-specific information as possible. Carolina Gardener Magazine — As the name implies, this magazine specifically covers both of the Carolinas, and it breaks down seasonal to-do lists by geographic region, including the Piedmont. For beginning gardeners, or newly arrived gardeners from other regions, this magazine will get you pointed in the right direction. This publisher offers magazines for other US states, too, so you should be able to find an appropriate one for your gardener’s region. This is a magazine best suited for beginners. Horticulture Magazine — This magazine offers articles for beginners and more advanced gardeners, and a section on region-specific gardening (in our case, the southeast) is offered. This would be a good choice for gardeners with at least a little experience. I stopped subscribing to this magazine some years ago, because I felt I wasn’t getting enough new information to justify the cost of a subscription. But for less seasoned gardeners, this is not a bad publication. Fine Gardening Magazine — This is a beautifully photographed magazine. It does offer at least one step-by-step how-to article in most issues, and it also offers region-specific information. I think it’s a tad more sophisticated than the first two magazines I listed. I only recently stopped subscribing to it, again, because I just wasn’t getting enough new information to justify subscription cost. Organic Gardening Magazine — This was my go-to magazine for my first couple of decades as a gardener. The publication has changed a lot since those days. To be candid, I’m not a fan of this magazine in its current form; the articles lack depth, and there’s just not enough information in an issue to justify its cost. But to a very new gardener interested in organic gardening, this might be a good introduction. Buy them a membership in the American Horticultural Society. Headquartered just outside of Washington, DC, this group is a national treasure. Among many other important activities, it sponsors the annual Children & Youth Garden Symposium, which is held in different parts of the country every year, and offers a vehicle for everyone interested in getting children into gardens to exchange ideas and techniques. A benefit of membership is their publication, The American Gardener Magazine. This one is always worth reading cover to cover. The Avant Gardener — this is an inexpensively published (no pictures) 8-10 page newsletter produced by a gentleman in New York. He reads all the horticultural literature and summarizes the best bits in his monthly newsletters. He occasionally does theme-based issues that can be very interesting. For $24/year for 12 issues, this is a publication most gift givers can afford. As an editor and writer, I cringe at the typos in every issue, but the information is worth the typographical pain for me. He doesn’t have a Web site. Send your check to The Avant Gardener, P.O. Box 489, New York, NY 10028. UPDATE: In the latest issue of the The Avant Gardener, I learned that he is offering some seasonal gift deals. Gift subscriptions to US addresses received before the end of the year (Dec. 31, 2011) only cost $18.00. And a three-year subscription will cost $50.00 for the same time period. If you give three one-year gifts or one or more three-year gifts, you can extend your own subscription at the same great rates. HortIdeas Gardening Newsletter — This is another no-pictures newsletter, published bi-monthly. The writing is more technical than what you’ll find in The Avant Gardener, and they now only offer an electronic format — they e-mail you a PDF file twice a month. These folks read all the scholarly research as well as the more commercially oriented research. If your gardener wants unvarnished cutting-edge information, she will love this publication. Buy them a publications-only membership to the Brooklyn Botanic Garden. I have never visited this famous public garden, and I may never get around to it. But I have been a member for many years because of their Brooklyn Botanic Garden Handbook series. These beautifully photographed and written books come out several times a year and cover every gardening topic you can imagine. I’ve got handbooks on ferns, herbs, native plants, xeriscaping — you name it, they’ve produced a book about it. These are resources I still consult regularly. I have far exceeded my usual word count for a post, but I think I’ve offered ideas that should suit just about everyone. Let me close by offering one more notion. Seasoned gardeners like me are usually older folks. We love the work, but our bodies are often not as willing as they once were. We also love to talk about our passion. If you are a less experienced gardener with a seasoned gardener on your gift list, consider offering the gift of labor. In exchange for help moving mulch or dividing perennials, you’ll learn much, and I can just about guarantee you’ll walk away with armfuls of free, choice plants. Just be sure you’re willing to do the work involved to earn those plants. Happy holidays to all, and to all gardeners — sweet dreams of spring gardens to come. Tis the season of gift buying for many, so I thought I’d offer a few suggestions to you folks buying gifts for gardeners. In today’s installment, I’m focusing on gifts for experienced gardeners. We are the obsessed green-thumbed, dirty-fingernailed bunch you see puttering in our yards in all kinds of weather. First, if you love us, please don’t buy us a plant — or even a package of seeds. We know you mean well, but odds are you have not been paying close enough attention to us to know which perfect plant we still want to squeeze into our landscapes. Exceptions do occur. A few years back, my mother-in-law caught me sighing over a catalog that featured a bearded iris called ‘Batik.’ She remembered the iris and the catalog, and ordered it for me for my birthday. I still think of her fondly every spring when it blooms. 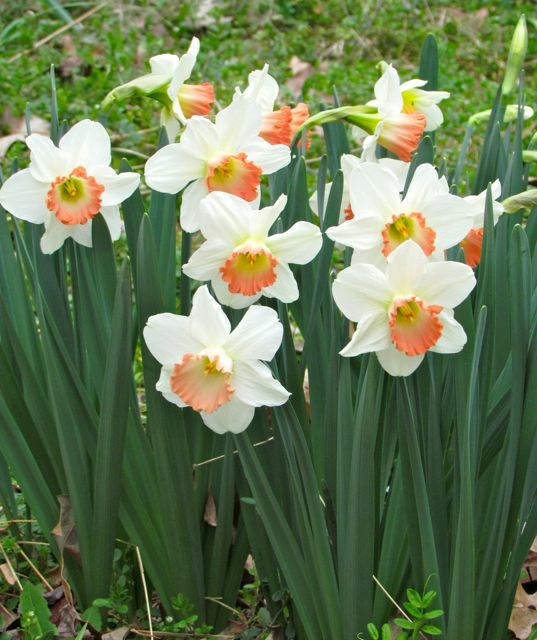 Bulbs and their relatives (rhizomes, corms, tubers, etc.) are safe to buy if you know exactly which variety your Obsessed Gardener desires. For anything else, I suggest gift certificates. To hard-core gardeners like me, a gift certificate to one of my favorite nurseries is not an impersonal cop-out gift. To me, such a gift is permission to indulge in a fantasy I had not yet found room for in my budget. It is permission to splurge. In my part of the Piedmont of North Carolina, I am lucky enough to be surrounded by many wonderful speciality nurseries. Whenever I can, I buy from one of these local sources, and if you know which local nurseries the gardener on your list favors, go forth and buy a gift certificate from one of those. However, the nurseries I favor also operate mail-order services. So to help you southeastern Piedmonters who may not live near local speciality nurseries, here’s my short list of favorites with links to their sites in alphabetical order (so as not to play favorites). Camellia Forest Nursery — As you might guess, they specialize in the most spectacular camellia varieties you will ever lay eyes on. But their inventory goes far beyond camellias to many other exquisite plants. Peruse their site; you’ll see what I mean. Niche Gardens — This nursery emphasizes native perennials and woodies, but also features a number of choice non-native plants. Niche Gardens is the closest nursery to my house, and when they offer sales, I have great difficulty resisting temptation. Plant Delights Nursery — Tony Avent is the plant-obsessed genius behind this nursery. If a choice plant well-adapted to the southeastern Piedmont is out there — anywhere in the world — Tony will find it, test it in his garden, and propagate and sell it if it passes muster. If the gardener on your list loves hostas — or any of a gazillion other choice treasures — a gift certificate from this establishment will make you a hero. 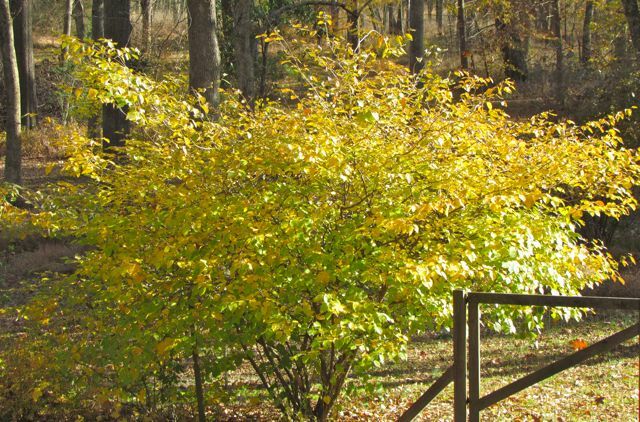 Woodlanders — This nursery is in South Carolina, but it is the best place I know of to buy small woody shrubs and trees that are hard to find elsewhere. Woodlanders sells most of our native trees and shrubs. They usually offer the straight species, and if they like some named cultivars of those species, they grow and offer those too. These folks ship small, bare-rooted plants, so I recommend this place only to seasoned gardeners. We know how to treat bare-rooted new arrivals, and how to nurture small plants into giants. I love this place because I can get small, less-expensive specimens that fit within my budget. I’m willing to be patient with them, knowing that magnificent trees and shrubs will adorn my yard after a few years. If you know a gardener like me who is willing to patiently nurture small special plants, consider giving a gift certificate from Woodlanders. Seasoned gardeners are also usually obsessive readers of garden-related literature. However, most of us already subscribe to the magazines we prefer, so I don’t recommend subscriptions as gifts for experienced gardeners, unless they have explicitly told you this is what they want. Likewise, buying equipment for us is problematic. We are picky. We know what we like and what works. But if you’ve seen us eyeing our favorite garden equipment catalogs, a gift certificate from one of those will always be appreciated. Perhaps you have a seasoned gardener on your list who is cutting back on his gardening for health or time reasons. Trust me, such folks still love gardens, even if they can’t be active in their own personal Edens anymore. Most gardeners in this category enthusiastically support one or more public garden, usually one in their region. If you know which public garden your less-active seasoned gardener supports, consider giving a donation in his name to that organization. Even those of us who still actively garden appreciate it when our friends and family donate to our favorite public garden in our names. Personally, I am always delighted when one of my friends or family members honors me with a donation to the North Carolina Botanical Garden in Chapel Hill, NC. That should be more than enough to help anyone seeking gift ideas for the serious gardeners on your list. Next time, I”ll offer gift suggestions for less-experienced gardeners. You know the saying that moss always grows on the north side of trees? That’s because the north-facing side of tree trunks is usually slightly cooler, shadier, and more moist than their other sides. Moss likes cool, shady, moist spots, so it often grows on the north-facing sides of trees — at least in North America. Such mossy spots exist because of differences in microclimate. A microclimate is the climate of a small area that differs from its surrounding area. It may be hotter, cooler, wetter, windier — but something makes that spot slightly different from its surroundings. In the southeastern Piedmont, north-facing steep slopes adjacent to creeks and rivers create microclimates that favor some of my favorite plants: Beech trees, spring ephemeral wildflowers like Hepatica and Blood Root, and Pawpaw trees to name a few. Even the smallest suburban yard has microclimates. The south side of your house differs from the north side. A hilltop will be drier and windier than the bottom of a hill. 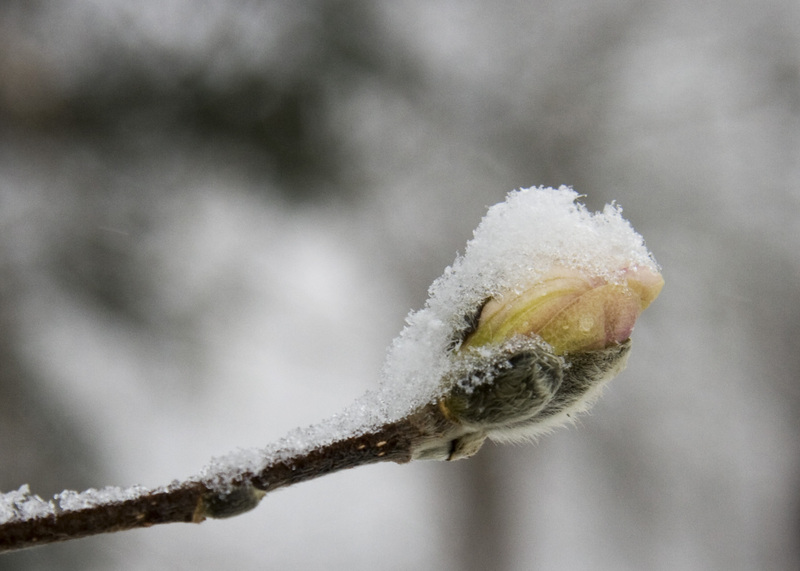 If you pay attention, soon you’ll know which parts of your yard get frost soonest, where the snow melts first — or last. These are clues to microclimates in your yard. One of the most striking microclimates in my yard is the south-facing wall of my garage. Even during a record 20-inch snowfall, less than an inch piled up within two feet of that wall. The birds figured it out, huddling together for warmth on the one spot of remaining bare ground. I think it may be a full zone higher there. I’m mostly 7B, but I’m pretty sure I could safely grow Zone 8 plants behind my garage. I’ll get around to trying eventually. Last week, two Winterhazel (Corylopsis sp.) shrubs growing within 20 feet of each other reminded me of the importance of microclimate differences. I wrote about these non-native early spring bloomers here. The one in the photo at the top of this entry shows off its lovely yellow autumn color. 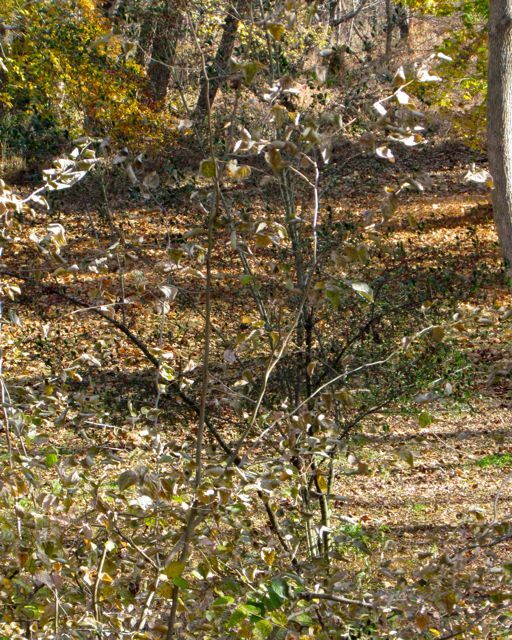 Probably because it’s not native, it is slower to color up in fall, which makes it more susceptible to early freezes. The Winterhazel in the above photo grows a bit uphill from an identical shrub that I planted just above a little pond near our creek. Both shrubs are the same size. The one in the top photo often blooms a few days before the other, but I hadn’t realized the significance of that difference until last week when our low hit 24 degrees Fahrenheit. The shrub above was unaffected by the cold. But its sister shrub by the pond, which had only just begun to show fall color, was zapped hard. The leaves died instantly, turning pale and falling to the ground. Here’s a photo of the zapped shrub shot the same day as the one above. You may need to click on it to see the few dead leaves still clinging to the branches. Although unsightly, the zapped Winterhazel is not damaged. It will still bloom next spring. But the striking difference between the appearance of these identical shrubs caused me to take a hard look at their microclimates. The still-beautiful Winterhazel is a bit higher up the hill, which may mean the cold air doesn’t collect on top of it quite as quickly. But I think the big difference is my house. The pretty Winterhazel is completely protected from north winds by my house. The zapped Winterhazel is not only lower down the hill, it is just far enough to be out of the wind shadow of my home. North winds have a direct line from the north side of my yard, past my house, to the south-facing floodplain where the zapped shrub resides. The difference between the two microclimates was probably just a degree or two, but combined with a biting north wind, the zapped shrub surrendered to the cold. These two shrubs reminded me of the importance of paying attention to microclimates whenever I’m planting new additions or relocating established plants. As in so much of life, the smallest differences can have the largest impacts. For an excellent discussion of microclimates, check out this site. You are currently browsing the archives for the Tools & Techniques category.